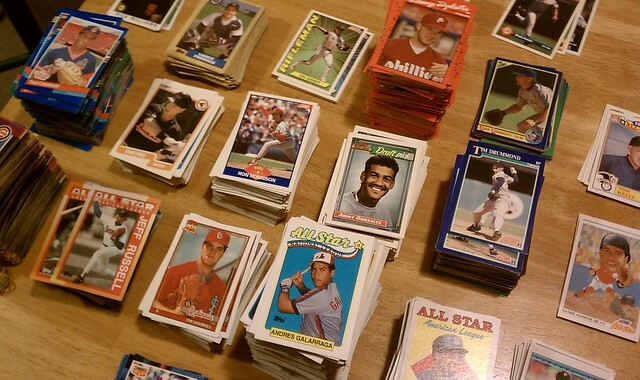 I’m sure I’m not alone in the group of kids that collected baseball cards in the 80s/90s with hopes of cashing them in 20 years later so you could retire. Funny thing is that never happened. The baseball cards from about 1982 to 1995 are probably some of the most worthless cards ever produced…because they produced millions of them. 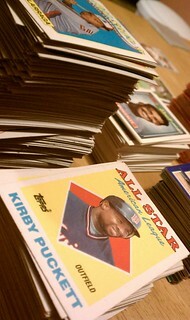 Value is often dictated by rarity so guess what happens when every kid had every card and never threw them away? My generation was the one of the first to fall victim to the birth of the “manufactured collectibles” and baseball cards were our gateway drug. So what are we to do with our stacks and stacks of worthless cardboard? An all-star card could be worth big points! The concept for Mutant Baseball Survival is based on your average RPG game…simple at its core but easy enough to add your own rules, situations, etc. However, one problem I had when I was playing RPGs weekly was the effort and time it took to get to the action (I wanted less “role” and more “play”). So not unlike some other quick-campaign games out there, my Mutant Baseball Survival game would use your old baseball cards as the players and monsters in the game. The story and unique challenges along the way would be up to the players. I suppose you could have a constant DM but I’d suggest passing those responsibilities to each player as you go, share the wealth, you know? Just keep it simple. Like I said, this is still an idea in progress but here’s how you could setup the game. To start you need all your baseball cards…all of them. Commons, MVPs, rookies, team cards, managers, etc. Create a deck that isn’t too big – like Uno size – and shuffle them the best you can. Lets assume there are two players. Deal five cards face-up to each player. Do not look at the stats on the back. Each player will then select one of the common player cards as their first character. If there are any “marked” cards (rookie, MVP, all-star, etc) the player should put those aside as they will be used as upgrade cards. It might not be perfect but it’s not unreasonable and running the formula through some other random players from random years, the numbers appear fair in context. So those are your character’s base stats. Now lets do some instant upgrades. Assume that in the original 5-card deal you received a marked MVP card. You can now apply this card as a bonus to any of your character’s attributes. The amount applied could be up for debate but for now lets just say you add 5 points. And now your characters are ready to play. Similar to your player stats, the mutant stats determined by the player stats on the back of the baseball card. I propose you shuffle all the common player cards, manager cards and teams all together into a single deck (no marked cards). When your characters have an encounter battle, deal out cards from the deck and those are the opponents, however, their stats will have to be adjusted slightly compared to the formulas used for characters. Mutants you come across early in the game should be less or on par as your characters while those later should be harder. I don’t have any hard numbers for this yet but it will probably be basic number shifts. Now when it comes to mutants we can use some of the other baseball cards differently. For example, manager cards could represent boss battles. So if, say, Sparky Anderson is dealt as an opponent, he would demand unique stats – maybe the sum of all the other cards health points, or something like that. And team cards could require you fight five mutants regardless of level. There are a lot of options when it comes to the mutant bad guys, sky’s the limit! So you have your characters and you’re ready to fight some mutants…now all you need are your dice. You’ll need your standard set of RPG dice; 6d, 10d, 20d and whatever else you have on hand…you never know, plus throwing dice is just fun. The dice calculations are pretty straightforward. Your offense value is a maximum so when you attack you’ll need to roll a combination of dice to meet that number. So if your if your offense value is 30, you’d roll a 20d and then a 10d. The sum of those rolls is your attack value. Defense is calculated the exact same way and then just subtract the defense from the offense to find out how many health points to deduct per turn. Frankly, so far none of this is really all that amazing, I’m just substituting baseball cards for dice rolling when it comes to generating character stats…in the end it’s all random. So what makes Mutant Baseball Survival fun beyond the basics of tabletop gaming? The answer is in the name: baseball. The trick to make this whole concept work is that you maintain all the player names and teams as you play the game. So when you choose Greg Maddux at the beginning, your character is Greg Maddux, it’s not just his numbers being used for a character you make up. Same goes with the mutant bad guys. When Nolan Ryan shows up as your opponent, you’re fighting mutant Nolan Ryan, not some goblin or wizard. Hmmm…Greg Maddux versus mutant Nolan Ryan, who do you think would win? I’m not a die hard baseball fan, I’m casual at best. My knowledge of baseball is limited to a period between 1983 and 1997 but even that is enough to have fun with this game. 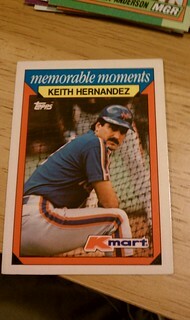 I can use what little popular 80s baseball knowledge I have and can easily come up with some fun story to play with. Maybe Tommy LaSorda ran out of Slimfast and needs you to battle your way to the Slimfast factory to get some more, but in order to get there you need to get to Atlanta airport which is guarded by Hank Aaron, and you need some magic item to appease Hammerin’ Hank. Or maybe Bo Jackson wants to get back into baseball so you need to go collect all the parts to build him a new leg and hip. Of course, your stories don’t have to be baseball themed at all. Heck, throw Greg Maddux into the middle of a medieval castle if it sounds fun. Maybe you need to rescue Ozzie Smith from a band of Romanian gypsies that are forcing him to do gymnastics. Or, maybe…just maybe…you need to help Darryl Strawberry become a real world Walter White. It doesn’t matter what the quest while you have to fight mutant baseball players along the way. Don’t discount the power of a mutant Carlton Fisk guarding Johnny’s bench (see what I did there?). Like I’ve said, this is just an idea and it still needs a lot of thought, insight and feedback but I think it’s worth exploring. There’s a lot I haven’t even addressed – like leveling up and special abilities – but in the end it’s something different and something that could be a lot of fun with the right group of people sitting around with a few drinks. So go ahead and dig out your box of baseball cards and see what you can come up with…just report back here what you find out. Hey, for all you know this could be the next big thing. I’ll be exploring Mutant Baseball Survival more over on my Morning Toast blog, so check there later for more ideas, rules and calculations. Really good concept but i tried it and at some point one of the cards i fought had over a hundred defense and i couldn’t beat it because my power was only at 60. If you can think of a leveling up system and maybe have it so any card can level up your main card and not just marked cards. I have an idea that each time you kill an enemy you roll one die and whatever number that is you have to match it by rolling a second die. If you match it you get the card, if not you don’t get it.